It’s been all go down at the Mennaye this summer, not just refurbishment of the ground with new floodlights, and yes I am one of those looking forward to a Friday night game under the new lights, nor pre-season training with Ian Davies and Harvey Biljoen putting their charges through their paces not just at the Mennaye but around the Duchy too, but off the field. I reckon CEO Josh Lewsey’s Range Rover has clocked up a few miles as he criss-crossed Cornwall pressing the flesh and spreading the word of the Pirate’s new dawn. Not just in Cornwall but further afield with Thursday’s game at the HAC against Saracens a great showcase in the City which will hopefully help further the Cornish Pirates’ as an attractive brand for potential investors for that push towards the Premiership when the time is right. Then there is the eagerly anticipated fixture against a Cornwall XV, which comes on the back of Cornwall’s great run to get to the Bill Beaumont Cup Final at Twickenham last May. It’s just a week to go to the already well-publicised match between the Cornish Pirates and a Cornish Clubs XV taking place at the Mennaye Field on Friday 30th August (ko 7.30pm). The special game, displaying a more collaborative and inclusive approach towards Cornish Rugby and also celebrating the opening of the Pirates’ new floodlights and hospitality facilities, promises to be part of a celebratory festival weekend, as there is not only rugby on Friday but also a triangular tournament on the Saturday (ko 5pm) involving the Cornish Pirates, Cinderford and St. Austell. One ticket (a two day festival pass) will cover admission to both days – see ticket information below. The Cornish Clubs squad will be drawn from all Cornish clubs, thus providing a great opportunity for one player from each and every club to take the field against professional players who will this season be competing in the Greene King IPA Championship and British & Irish Cup competitions. All Cornish clubs are being asked to nominate three players from whom the final squad will be selected, and the chosen squad will then be coached by ‘Benji’ Thomas, Gavin Cattle and Alan Paver. The Cornish Clubs XV will also be provided with a specially designed and cleverly impressive playing shirt, displaying the county of Cornwall image and incorporating names of the clubs. The players are also being asked to wear their club shorts and socks (Barbarians-style! ), and each player representing their clubs will also be invited to bring along their club’s mascot, suitably attired in their club colours and/or flag, if possible. It is envisaged that all of the clubs will help make this a truly festive rugby occasion, displaying all that is best in Cornish Rugby, with a big crowd expected. 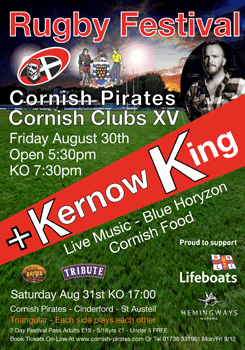 Besides the new floodlights, a new PA System, plus a new and upgraded Marquee hospitality facility, the immensely popular ‘Kernow King’ will be in attendance throughout, with other entertainment also provided by popular band ‘Blue Horyzon’. There will also be and RNLI presence, face painting and a Hog Roast. Ticket information: As mentioned above, one ticket will cover the matches being played on both the Friday and the Saturday. Tickets priced £15 for Adults & Concessions and £1 only for children under 16 (under 5s are free), can be purchased on-line at www.cornish-pirates.com and from the Cornish Pirates ticket office 01736-331961, open Monday to Friday from 9am – 12 noon. They will also be available at the gates on the match days. Season Ticket holders should note that their season ticket covers their admission to the games but for stand season ticket holders it does not guarantee them their chosen seat. The advice is to arrive early – note the gates and hospitality tent on each day will be open two hours before kick-off. 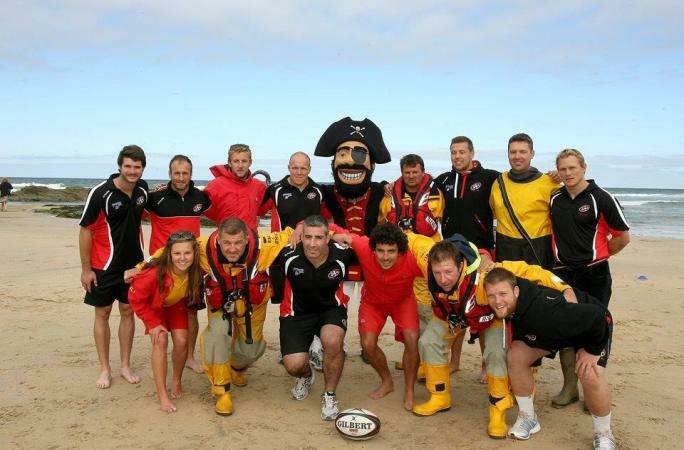 The Cornish Pirates rugby team will be supporting the RNLI as their chosen charity for the 2013/14 season. The partnership will mean regular appearances by volunteers of the RNLI at home games and Cornish Pirates team members will also wear a ‘Proud to support’ RNLI logo on their shorts. The Pirates, who play in the Green King IPA Championships, have close links to the RNLI, not least because there are four former players who are now part of the lifesaving team at the Penlee lifeboat station. They are Coxswain/Mechanic Patrick ‘Patch’ Harvey, Dave Pascoe, Wayne Davey and Adrian Bick. John Blewett, who tragically lost his life in the Penlee lifeboat disaster, was also a former player and popular captain of the 3rd XV. A positive RNLI presence will be seen at a number of Cornish Pirates games this coming season, starting with the match against the Cornish Clubs XV to be played on Friday 30th August (ko 7.30pm). Besides the RNLI, it should also be noted that the Cornish Pirates expect to continue supporting other worthy charitable causes as they importantly have in the past, including the Children’s Hospice SW.
Footnote: A short video featuring ‘Patch’ Harvey from the RNLI, and Josh Lewsey and Phil Westren from the Cornish Pirates is available to download from the RNLI online news centre. The interviewer is Tamsin Thomas, who is the RNLI’s Public Relations Manager for the south west.